The imperative tense is used to give command/order or request to the front person (second person) like “Sit!”, “Go!”, “Open!” etc. The person who is giving the command is the first person. The verbs in this tense are in مَــجْــزُوْمٌ mood. The following steps are used to construct the imperative tense. In the Arabic language it is not possible to read a word with the first letter having sukoon (ــْ) as a vowel sign. If that is the case then precede it with Hamza-tul-wasl, otherwise no need. This hamza will take Dammah (ــُ) if the second letter has Dammah, otherwise it always takes kathrah (ــِ). 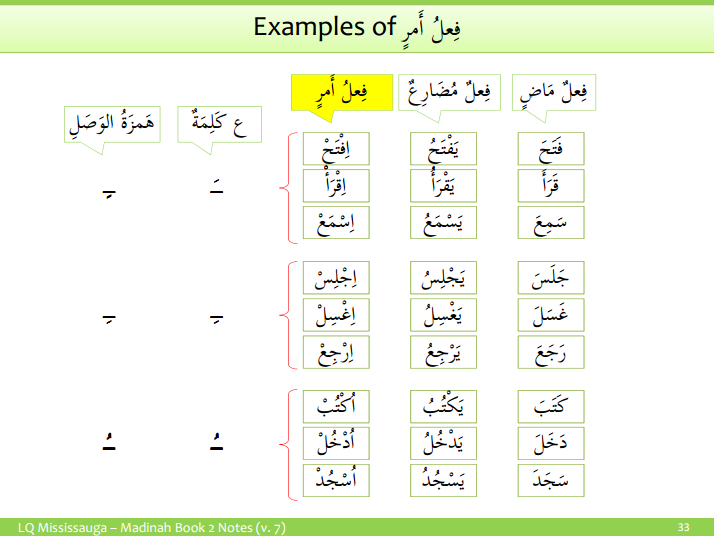 Example: As in فْــتَــحْ there is fatah (ــَ) on the second letter ت so hamzah will take kathrah (ــِ). Thus the imperative tense will be اِفْــتَــحْ. Its meaning is “Open!”. 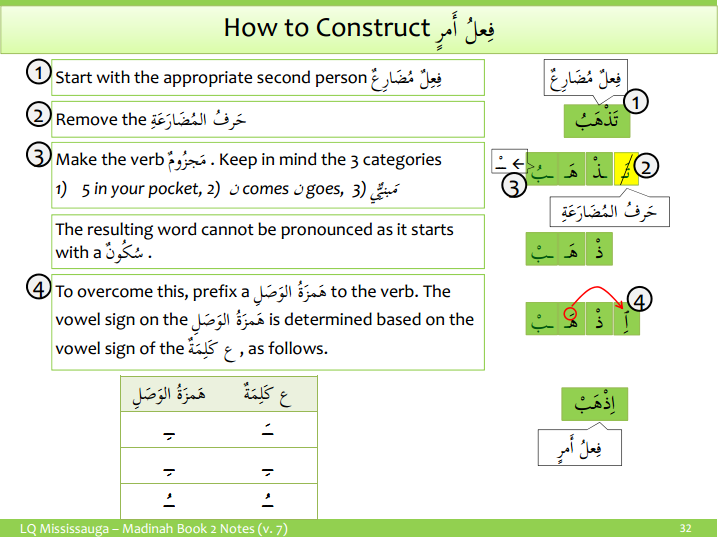 By using the above steps the following table shows the construction of imperative tense for the verb فَــتَــحَ with respect to 6 personal pronouns. State TRUE or FALSE: Read the verse Quran (18:28). The imperative tense اِصْــبِــرْ (be patient!) is present in this verse. State TRUE or FALSE: Read the verse Quran (18:45). 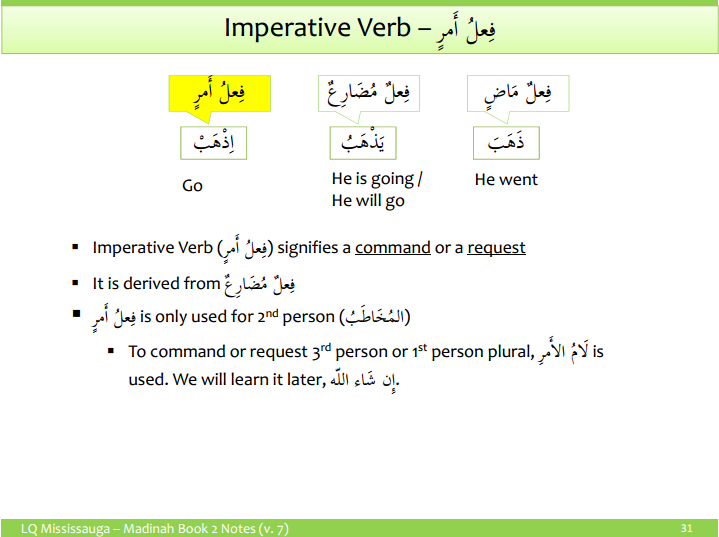 The imperative tense اِضْــرِبْ (give example!) is present in this verse. State TRUE or FALSE: Read the verse Quran (18:50). The imperative tense اُسْــجُــدُوْا (you all do prostration!) is present in this verse.